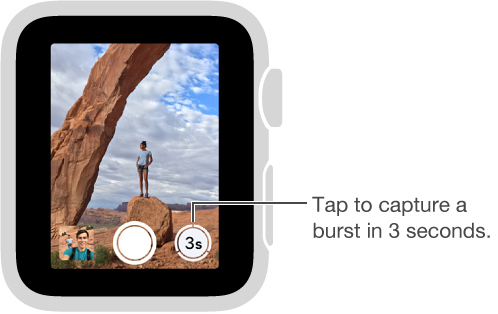 You can use Apple Watch to set a shutter timer—gives you time to lower your wrist and raise your eyes when you’re in the shot. Use the shutter timer. Open the Camera app , then tap the Timer button in the lower right. A beep, a tap, and flashes from iPhone let you know when to expect the shot. The timer takes a burst of shots, so you’re sure to get a good one. To pick the best shot, view the photo in Photos on iPhone, then tap Select (below the photo).